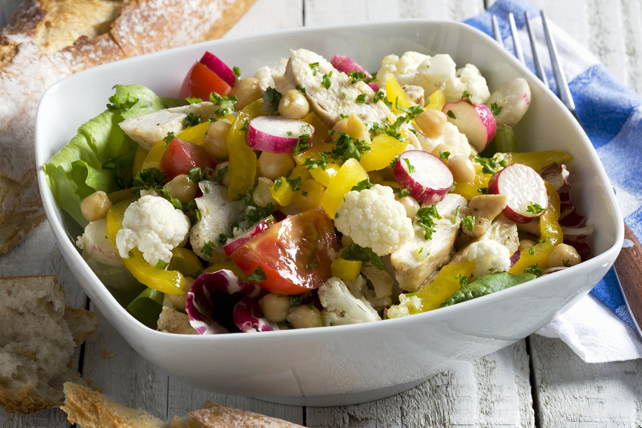 Tomato wedges, sliced radishes and chopped fresh parsley add welcome colour to this hearty Chicken and Cauliflower Salad for a Crowd. Cook cauliflower in saucepan of boiling water 6 min. or until tender; drain. Rinse with cold water until cooled; drain well. Place in large bowl. Add all remaining ingredients except parsley; mix lightly. Add 1 cup Cracker Barrel Crumbled Feta Cheese with Oregano, Sun Dried Tomatoes and Black Pepper to the salad before sprinkling with the parsley.